Things [underlined] I’ve [/underlined] learnt. the motto – just you wait. to how long you can wait. old hang about and wait. learn how to bloody wait. and a certain mild relief. my dear friend Ashtons head. but might be rather rude. he’d be back again next day. So Harry Rumbolds doing fine? Well that is nice to know. and he’ll have pots of dough. but not to me. I’ve had some, that is my last resort. Poison. This is one occasion where Mr. Hunt and I see eye to eye. To drink is definitely dangerous. I know a bloke in Inverness who wants to come here – he wants locking up. P.S. Does Beacham work there now or is he still on No 6.? P.P.S. Tell brother George there’s a fellow here fought in the last war. He’s a decent bloke otherwise. P.P.P.S. Tell brother Jack Id [sic] like to see him - in clink. Youre [sic] right it does. 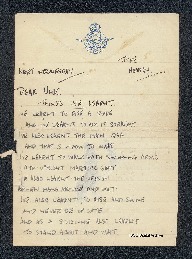 Peter Lamprey, “Letter from Peter Lamprey to W Gunton,” IBCC Digital Archive, accessed April 24, 2019, https://ibccdigitalarchive.lincoln.ac.uk/omeka/collections/document/6553.